The rule of law must be used as a tool to vindicate the rights of indigenous people and to ensure that development in the post-2015 era protects their lives, livelihoods, resources and environments, urged Judit Arenas, Deputy Permanent Observer of the International Development Law Organization (IDLO) to the United Nations. Speaking at the Fourteenth Session of the UN Permanent Forum on Indigenous Issues, Ms. Arenas drew parallels with the ongoing negotiations on the post-2015 development agenda and emphasised the opportunity that these offer to address indigenous issues. She cautioned that without the full participation of indigenous peoples in the post-2015 agenda; without strong justice institutions to enforce laws to protect indigenous lands and rights, and to end inequalities and discrimination; and without adequate legal education and awareness to level the playing field, indigenous peoples will not secure the protection and status they crucially need in order to benefit from the post-2015 era. IDLO had seen the rule of law act as a tool of empowerment, Ms Arenas said, allowing whole societies to pull themselves out of poverty and improve their lives. She added that IDLO had worked to strengthen the accessibility of law and justice for the world’s most vulnerable populations, including women and indigenous people. This session of the UN Permanent Forum on Indigenous Issues took place in New York in parallel to the fourth round of inter-governmental negotiations on the post-2015 development agenda. For the full statement, please see WebTV and read our Policy Statements. 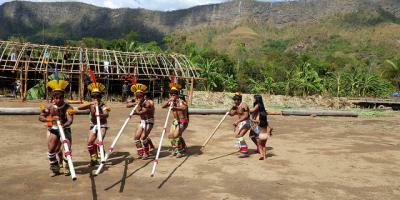 For more information on our work with indigenous peoples, please see our website.